The Victoria Police Museum, now open Saturdays as well as throughout the week from 10am to 4pm, provides a refreshingly different museum experience in Melbourne's CBD. It's obvious from the museum's twitter that the place is staffed by a team with serious personality, who are willing to acknowledge – and capitalise on – audiences' fascination with all things grimy, dodgy and suss in Victoria's past. This willingness not to shy away from the seedy underbelly of this city translates into a very cool museum. Visitors are treated to displays of vicious weapons, Kelly gang armour, and tools of the crime fighting trade. Anecdotes about crims and the cops who catch them provide intriguing insights into a profession often only viewed through the media and fiction. Younger visitors (actually, let's face it, visitors of any age) will be particularly fascinated by slightly disturbing exhibits such as the nineteenth century vampire hunter's kit…complete with dagger, gun with silver bullets and vial for holy water. There are big guns, mysterious spiky objects, and the wreckage of a burnt out car involved in the Russell Street bombing. Add to all this an old police motorcycle and a bomb disposal robot, and you've got yourself a museum that brings out the overexcited ten-year-old in us all. At this point I should add that the museum does warn visitors that some of the displays are, well, not particularly nice, but I have a very low threshold for that kind of thing, and I didn't scream or cry once. Nor did the museum induce any nightmares. Lest I be considered shallow, let me add that the Victoria Police Museum is more than just entertaining. Careful examination of the exhibits reveals a considered approach, exploring Victoria's social history through its crimes. For a relatively small museum, there's a lot here to take in. And whilst what's on display is intended to excite and interest visitors, it will also raise awareness of the changing nature of crime and policing. This is a museum with a message – yes, crime is fascinating, but it doesn't pay. 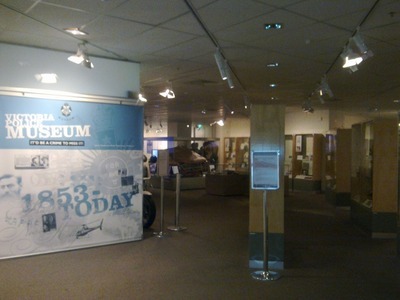 The museum is located in the World Trade Centre, near the corner of Spencer and Flinders Streets (entry via Siddeley Street). It's a little tricky to cross to with all the bridges and traffic, but once you reach the building the museum's easy enough to find on the lower concourse level. There's no parking available at the museum, but the City Circle tram passes nearby, or it's an easy 200-metre walk from Southern Cross Station. There's a small cafe across from the entrance to the museum, and plenty of other lunch options nearby. Tours are available most days, but best to call first.